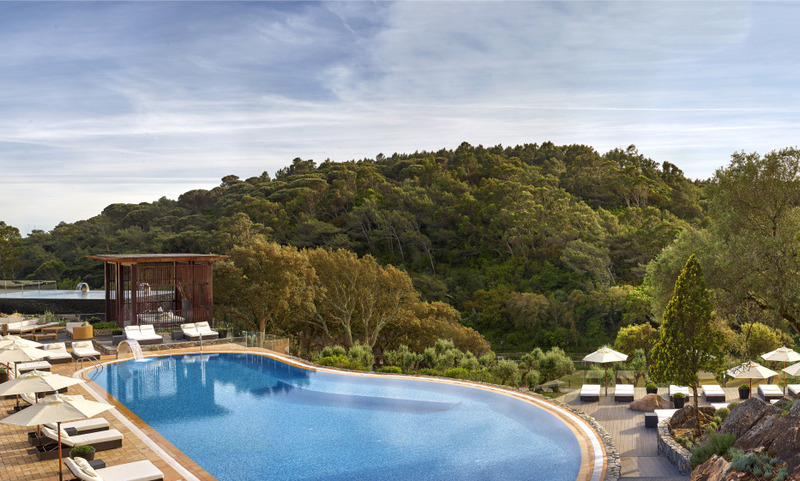 Set in the lush, green folds of the Sintra Mountains, the Penha Longa Resort checks all the right boxes for a mountainside getaway...and then some. Lisbon’s most under-the-radar hideaway is where the Portuguese royal family would retreat to for milder summer temperatures at the foot of the Sintra Mountains. At the Penha Longa Resort, travel dreams come true in a fairytale setting. Exclusivity, history, natural beauty...the hotel offers it all with its unique location in the heart of a protected natural park and facilities that are simply out of this world. There is a 27-hole championship golf course designed by Robert Trent Jones and a number of indoor and outdoor swimming pools that stand separate from the hotel’s 1500 m2 spa and wellness area. Not to be outshone, the hotel’s eight dining venues, overseen by the likes of Michelin-starred chef Sergi Arola, deliver unique gastronomic journeys.. It's a beautiful hotel, in a beautiful area. It's a resort style (in fact I did not know about that at the time of the booking) and this was not what I was looking for. But the hotel is beautiful and adequate for big family reunions and/or business getaways. This is one of the best hotels in Portugal. I loved my stay last year, and this year was even better. If I ever get the chance you can bet that I will come and stay at this hotel once again. Great place we have visited several times, service and standard is very high. Everybody seems dedicated to help and support in a very professional and pleasant way,- great staff. The resort in itself and the grounds are amazing, but staff friendliness and service mindedness is your true competivite advantage. Your staff helped us out with a variety of usual, and unusual, requests during our 5 night stay. We had contact with door men, reception staff, the concierce, house cleaning, golf staff, the electrician, waiters and resaurant staff and bookers, and every single one of these people performed their duties with a smile and showed true interest in us during our entire stay. The golf course was in good shape! Tough greens! We had a wonderful stay and will be back. A very beautiful hotel tucked away in a calm and serene area, whilst still being close to Sintra, Cascais and Lisbon and though the building is quite big, the hotel still manages to feel very intimate. The clientele is varied (grandparents/parents/children, some quite young) but everyone is made to feel right at home. To sum it all up, we had a great holiday here, at once relaxing and activity filled, all in a spellbinding environment. It would be great to return to the Penha Longa. One of the best hotels I have been at. The Ritz-Carlton experience really makes a difference. The first time I visited the hotel was early 2006 when I organised a car launch for Toyota. It was a fantastic experience. I must say that the hotel has aged since then, the outside of the hotel needs some serious maintenance. In the room, the electricity plug next to the desk looks like from another century (room 326). My husband found the water pressure from the shower not strong enough. One big bravo to the golf pro's who were extremely friendly &amp; accommodating, we had a great time ! Overall a nice experience.